Lesbian Book Bingo — Join our reading challenge and win great books! To make 2018 a little more interesting for all avid readers of lesbian fiction, I got together with a bunch of fellow lesbian book addicts and came up with a fun reading challenge: Lesbian Book Bingo! How does Lesbian Book Bingo work? Download this cool Lesbian Book Bingo card (letter size or A4). Throughout the year, fill in your bingo card with the titles and authors of lesbian books you have read in 2018. You can either type in the PDF or print it out and write by hand. Each square of the bingo card represents a certain subgenre or theme. For example, if you started the year by (re-)reading Backwards to Oregon, you would write “Backwards to Oregon by Jae” into the “historical fiction” square. I will post suggested reading lists for each square here on my blog twice a month, so by the end of the year, we’ll have 24 lists covering all squares of the bingo card. Of course, you can also pick any other lesbian book that fits the category. For more suggestions, take a look at these lists of books from Ylva Publishing and Riptide Publishing. If you’re not sure about what some of the squares mean, take a look at the FAQs. For the “free choice” square in the middle of the bingo card, you can read any lesbian book of your choice. You win by completing a horizontal, vertical, or diagonal line on the bingo card, which means reading at least five books. While you can read the books in any order you want, you might want to wait for the lists of suggested books I’ll provide on my blog twice a month so you don’t miss out on some excellent books. Here’s a master list of categories for all bingo squares with a schedule of when each list will be posted. What books can you pick for Lesbian Book Bingo? It needs to be a book you read (or re-read) in 2018. It needs to be a book with at least one main character who is a woman who loves women. You can read a book of your own choosing that matches one of the squares or pick one from the suggested reading list for each square. It doesn’t necessarily have to be a novel. Novellas (usually around 17,500-40,000 words) count too, as do anthologies and short story collections. You can either read a book (paperback or e-book) or listen to it (audiobook). Any format counts! Each book may be used only once per card. So if you read a romantic suspense novel about a detective who falls in love with her new partner, you have to decide if you want to put it down in the “romantic suspense” square or in the “workplace romance” square, but you can’t use it for both squares. What can you win and how? You can win some great ebooks by participating in Lesbian Book Bingo as well as several paperbacks and audio books. More than 250 authors and almost 50 publishers such as Bold Strokes Books, Bella Books, Ylva Publishing, Bedazzled Ink, Riptide Publishing, Desert Palm Press, Intaglio Publications, Regal Crest, Dirt Road Books, Affinity eBook Press, Bywater Books, and many others are participating. Twice a month, you can win an e-book by checking in when I post the recommended reading lists. All you have to do is to leave a comment on this blog, letting us know what book you are reading for this square or suggest another book that fits the category, and you’ll be entered in the drawing. 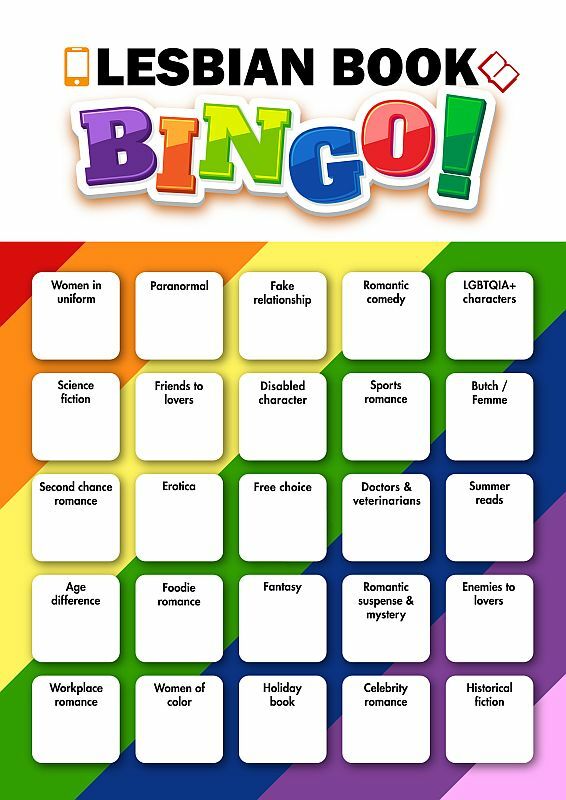 If you complete a horizontal, vertical, or diagonal line of the bingo card, you’ll win an e-book from one of the 250 great authors of lesbian fiction participating in Lesbian Book Bingo. You don’t even need to be the first person to complete a line to win. Send me an e-mail with the PDF or a photo of your filled-out bingo card attached, and you’ll get an e-book in the format of your choice. Each reader can win only one e-book, even if you complete several rows, columns, or diagonals—unless you complete all 25 squares. The deadline is December 31, 2018. If you complete all 25 squares and e-mail me your filled-out bingo card, you’ll be entered in the drawing for the grand prize. There’ll be three winners. The first one wins 25 e-books and a fun surprise package from Germany, and the other two win 25 e-books. Don’t miss any of the Lesbian Book Bingo posts! The recommended reading lists for each square will be posted on the first and third Thursday of each month, starting on Thursday, January 4. Winners of the “leave a comment” giveaway will be announced one week later, on the second and fourth Thursday of each month. If you’d like to get all Lesbian Book Bingo posts sent to your in-box, subscribe to my blog. Join us for the Lesbian Book Bingo, read great lesbian books all year, discover new novels and authors, and win fantastic prizes! Oh what an awesome idea! I hope you do it again this year. If not at least you have provided lots of books to read!! This is gong to be so fun!! I’m really looking forward to it. Thanks for checking it out! I hope you’ll enjoy the book bingo. My pleasure! Thanks for participating! Thanks for checking it out. I think it’ll be really interesting. Oh well, there are many more books to read…or re-read. Happy New Year! This will be interesting, maybe even delve into genres I don’t usually read! I think that’ll be half of the fun! Thanks for participating! Wondering which overachiever will be first to complete all the squares!! This will be fun, thank you! There are even a few readers who already told me they’ll try for two completed bingo cards! Thanks Jae. I’m looking forward to be challenged in categories IO don’t normally prefer. What a novel way to get people reading new books!! Haha… thanks for all of your hard work, can’t wait to get started!! Rae from Seattle WA. First time responder, long time reader. This is very exciting! I love reading challenges and this one has additional incentives. While I do wish there were like 10 Historical Romance squares, this will encourage me to branch out and find new great stuff. That’s exactly the spirit of book bingo–getting readers to read across genres and try new authors. Thanks for participating! How exciting! I love this extra reward for reading. Count me in! Oh my days, this is going to be so much fun! I love book bingos and reading challenges, but have never officially participated in any before. Thank you for organizing this! What a great idea! I look forward to having even more fun reading lesbian books this year! Looking forward to reading some books I ordinarily might not try. Thanks, Jae!! A love a challenge, and a book challenge is just that much sweeter. Bring it on! Excellent idea. Looking forward to it. This is awesome, thanks so much for organizing it! Last year I searched high and low for a wlw book challenge that wasn’t something self-directed and couldn’t find anything. So, when I saw this teaser the other day, I was ecstatic, and now reading all about the challenge. Awesome is just too small a word for how fun this is going to be!! What a fun idea! Thanks for putting this all together. It is certainly something to look forward to in 2018! This will be fun. I am ready to begin reading new books from different genres I normally don’t read. This will be exciting. Question: If you submit the complete 25 does it also count for the first time bingo ? Or should we when we get a line submit our card and then submit again when we hit 25. BTW I am very much looking forward to this! Great Idea. You could do either, but if I were you, I’d submit the first completed line as soon as you have it. That way, you get a free ebook sooner and can maybe even read it for one of the other squares. What a fun way to keep track of what I read this year. Looking forward to participating. What a great Idea! I read just about a book a day (sometimes re-reading my favorites). I would love to share some great authors work with like-minded readers. By the way, you could even complete several bingo cards and send them all in. More chances of winning the grand prize! What a great idea! Can’t wait to start. Jae, this is a wonderfully, creative idea. This is a fun way to start out the New Year! Thank you. Thanks for doing this, Jae! And thanks, Cara Malone, for also participating! You’re two of my favorite lesfic authors – though I admit to having many! I bet there’ll be more of your favorites on some of the lists! What a great idea…thanks Jae for this different Bingo..
Looks as if Lesbian Book Bingo came along at exactly the right time for you! Happy reading and happy new year! I love this. Can’t wait to participate! Thanks, Kathy. I hope you’ll enjoy the book bingo! So pleased this is happening! I’ve stopped reading of late, this definitely has me back reading! Awesome concept! That’s awesome! I hope you’ll have fun! I use Calibre as a library for all my books (and I can recommend it highly). In Calibre I can make virtual libraries for alle books with the same tags. It will take some time but after that I will have 24 Bingo libraries! Thanks Jae, what a wonderful idea! I have a question, would graphic novels count for the bingo? If they have a female main character who’s attracted to other women, sure! OMG!!!! This is going to be the best Bingo EVER!!! I can’t wait to start filling in my blanks! I usually read at least a book a day, so this is right up my ally! Thanks for participating! I hope you’ll have fun. This looks like a lot of fun! I’ll participate! Great idea! I love to read and am always looking for new authors, so I will definitely check out your list of recommendations. I’ve read a lot of science fiction in the past, but never f/f science fiction and I have been a little reluctant to try. Now I will have a reason to and I will certainly wait for your recommendation on that one. This sounds like fun! I have a feeling I will be buying a lot of books for this challenge since my local libraries don’t have a lot of lesbian books outside of YA or mysteries :( And their ILL dept takes forever!!!! Still, I can’t wait to dive in!!! Thanks for hosting this fun bingo challenge. Do Graphic Novels count or only normal books? Yes, sure. If they have female main characters who are attracted to other women, they count! This looks like fun, and we’ll get updates on new books to read. When do we start? I’ll post the first reading list (“women in uniform”) tomorrow (Thursday, January 4), but if you have already read a book in 2018 and it fits any of the categories/squares, you can put it on your bingo card. Two books down and I’m loving this challenge! It helps that I’m on holidays right now :-) Question, “LGBTQIA+ Characters” wouldn’t this be any book with lesbian characters as outlined in the rules? Finishing reading Officer Down by Erin Dutton. Ok, let’s get this started! Fragmentary Blue (Alex/CJ series, book 1) by Erica Abbott will be the first book of the challenge for me. I have a feeling I will be up all night reading this. Bingo! This is a splendid idea, I’m sure I’ll drop by regularly. Thank you, Jae. There are so many great books on the suggestions list for this ‘Women in uniform’ square. One of my favorite genres I must say. I’ve read quite a few of them and I’m trilled that I can add some more to my to-read-list. I’m currently reading ‘A More Perfect Union’ by Carsen Taite. That fits the bill, doens’t it? This is so much fun! I recently dove into lesbian fiction from a random list of lesbian books to read. It opened up the world of Bridget Essex, who gets the fantasy block (I assume that works) and just finished Strong which is messing with my head a little bit. This is a great way for me to explore new books and genres and do research for my wife’s writing at the same time. I can’t wait to see the various lists you share. I am reading Relic by Anne Hagan. Thank you for your list of suggested readings. For Women in uniform I had rad several on the list prior to this year. I just finished reading Of Scars and Duty By Natalie Debrabandere. A good read for this category that I would recommend. Any recommendations for the Science Fiction category and the LGBTQA+ characters for Lesbian book bingo.? by Lee Winter and for the LGBTQA+ category “Perfect Rhythm by Jae ” I have not read the first one but it was highly recommended and Perfect Rhythm is well.. perfect. I’ll post a reading list for each category, but to name just a few: “Without a Front” by Fletcher DeLancey for sci-fi or maybe “The Lily & the Crown” by Roslyn Sinclair if you want a sci-fi romance. For LGBTQIA+, take a look at the FAQ I just posted on my blog. Thank you for putting this together. I can’t wait to see what other books are out there that I have not read. I have read around 10 of Gerri Hill’s book and plan to read Sawmill Springs next! What a great idea! I’m looking forward to reading new authors. I’m an avid reader who has averaged over 100 books per year for the last several years. I read almost any genre. Now though, I’ll be able to concentrate on W4W books since you’re making available lists of these books in the different subgenres. I can’t wait to read more! Just finished Relic by Anne Hagan. Enjoying the BINGO! I guess we can count them too, but I’d rather have most of the squares filled by published books to support the publishers, editors, and writers who are trying to put out a professional product. That’s not to say that there aren’t some very fine fanfic writers, of course. Thanks, the story I was referring to has since been published (in an updated form) by Ylva. I cant seem to download this bingo card. Could someone please send me it. I just got a new lappy and trying to get my head around windows 10. I would appreciate any help. Would it help if I emailed it to you? I usually read more than one book at a time. Right now I’m reading The Morelville Mysteries collection by Anne Hagen, Josie and Rebecca The western Chronicles by Vada Foster and BL Miller again and Second Nature by Jae again as well. I tend to read certain books at least once every year. I don’t even participate but I am glad with the recommendations that Jae posted. It’s great to know that you value that work of the other writers too. Thank you so much! This may be a stupid question but if a nonfiction book fits a category can you put that down or do all the books need to be fiction? This square was the first I filled out for the bingo. I used Beauty and the Boss by Ali Vali but I can also recommend The Brutal Truth by Lee Winter. I’m excited for Lesbian Book Bingo! It sounds like lots of fun. I’m sorry to say that Book Bingo was running in 2018. I’m taking a break in 2019 since it was a huge, time-consuming endeavor, but I might run it again in 2020.